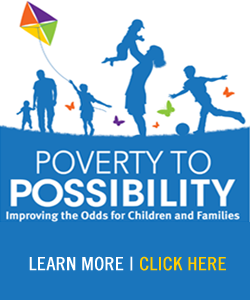 The poverty rate among children in our area has doubled in the past 12 years. One third of all children under age 5 in Luzerne County now live below the poverty line. Communities with a high poverty rate are known for higher crime rates, higher drug and alcohol dependency rates, poor education, more difficult access to healthcare, much more. For 93 years the United Way helped hundreds of thousands of people in need, supporting programs and services, but with each passing year, the number of people asking for help keeps growing, generous community donations barely stretch far enough to help them; and the root causes of that need haven't been reduced or eliminated. United Way of Wyoming Valley is taking the lead in the fight against poverty by looking at the big picture and developing strategies to combat the hardest issue plaguing our community and neighbors. Our new fundraising and fund distribution model is focused on reducing poverty among children by creating pathways to self-sufficiency for at-risk families. United Way prides itself on bringing together community citizens to work together for change, and we are asking for your support to join the fight against childhood poverty. Your contribution will help move the needle on reducing poverty in our community by helping to fund neighborhood agencies that are committed to our mission. Help us to spread our message across the community that childhood poverty must be addressed. We have multiple ways you can volunteer your time. Contact info@unitedwaywb.org if you are interested in serving as a Community Impact volunteer, a fundraising volunteer or in participating in or hosting a community service project. When a group of caring and strong people come together to rally behind a common goal, great things happen. By partnering with the United Way, Leadership Givers preserve the wellbeing of the community and, in turn, deserve special merit and recognition. Participation in the Leadership Giving Program is an indication of a deeper involvement and a resolve to do more. Support through Leadership Giving affords new opportunities to provide for local residents in need, and makes a positive impact on health and human service issues in the Wyoming Valley. Leadership Givers are compassionate people committed to achieving results and making a positive difference in people's lives. They have both the motivation and the resources to provide for our community, while inspiring friends, peers, and associates to follow their remarkable example. They lead the way by their commitment and integrity, and their willingness to make a powerful statement about their desire to care for and strengthen their community. View last year's Leadership Givers in our Annual Report. Members of the Leadership Giving Society spark the interest of others and lead the way toward building a stronger, healthier community through individual and combined spousal gifts of $500 or more. Our Leaders show by example and by giving through the United Way's individual Leadership Giving levels. The United Way of Wyoming Valley is committed to the long-term vitality of our community. In order to ensure that the needs of our community will be met well into the future, the United Way created a planned giving program. Through this program, supporters are able to contribute lasting gifts that will continue to help those in need for years to come. Planned gifts are made through assets, to guarantee long-term impact. Whether through a gift of stock, bequest, life insurance policy or a trust, donors can contribute to the United Way of Wyoming Valley's endowment, which will allow us to create an ever-strengthening impact in our community. The children of today and tomorrow cannot do this themselves- help us to move them and their families from POVERTY TO POSSIBILITY.